This is step by step guide to illustrate the process of creation a complex picture. In our everyday life we can see a lot of sporty wear but pretty poor details such as jewellery, drapery and decoration. I choose Induism as the great source of deep ideas and beautiful images. 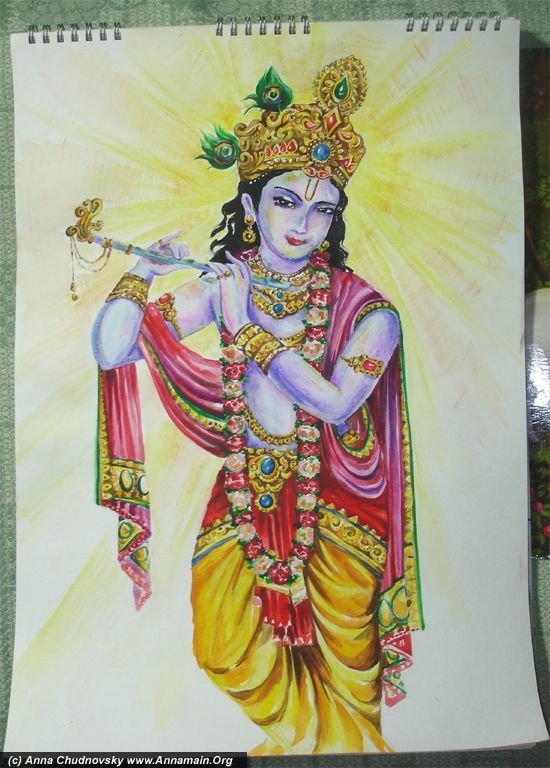 This image represents Krishna, 8-th Avatar of Vishnu, painted in classical style. More then 15 pictures below shows the process. 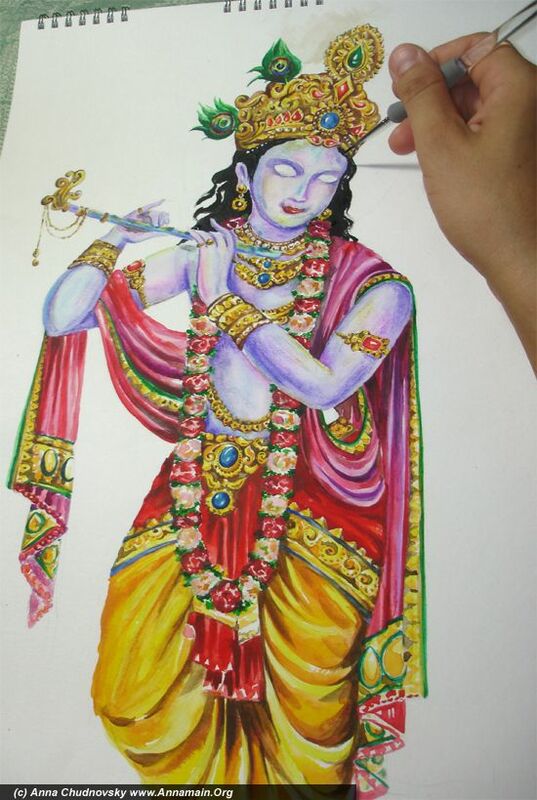 I used aquarel paper, aquarel colors and pencils; brushes #1, 2 and aqua-brushes size S and M. The work started with the full sketch with all details. 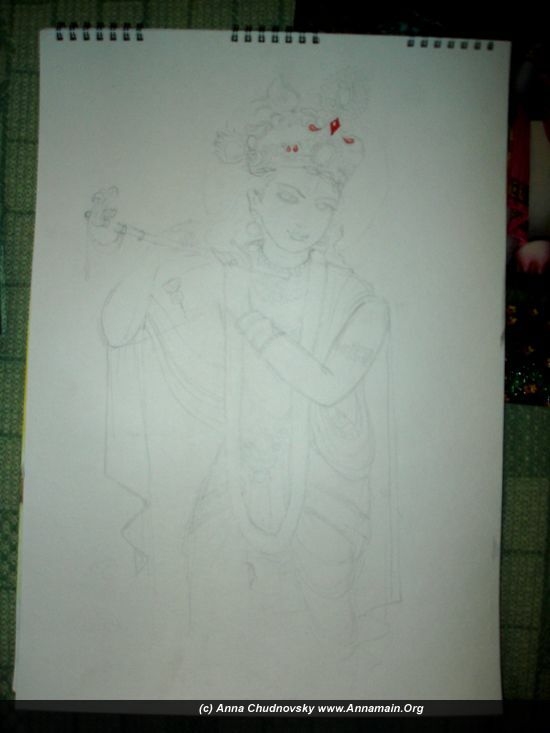 Usually I avoid such sketches and paint when I feel all picture in my heart, without pencil`s sketch. But this is so complex picture I need all details symmetrically organized. A started with red rubins on the crown. 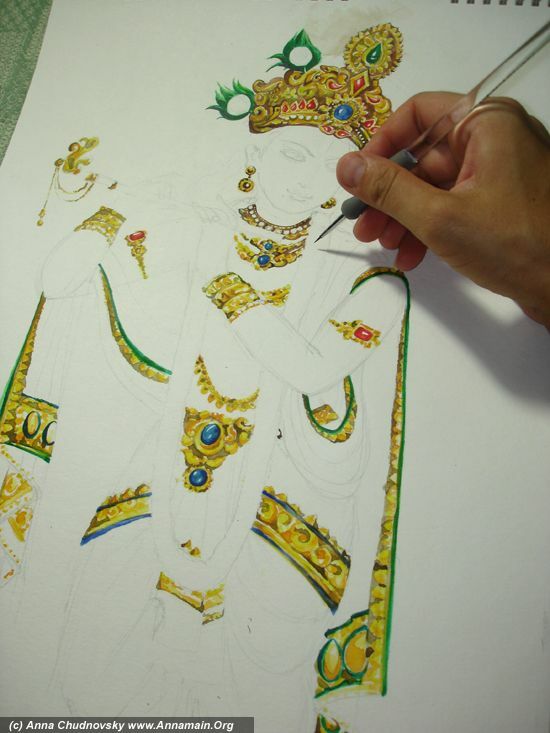 The crown is the most complex jewellery on the picture, with elegant design and precious stones. I did it from the front elements to back. 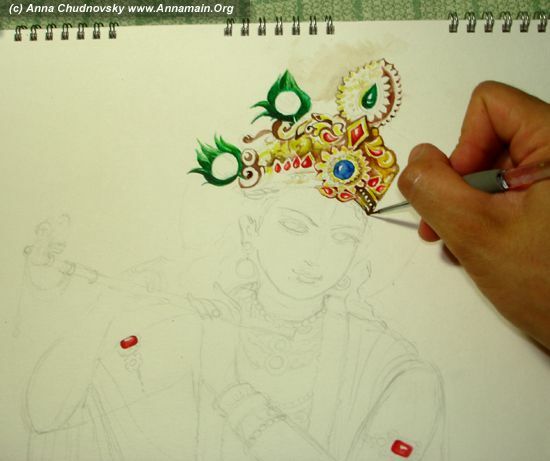 To make deep shadows on the crown`s design use brown color. 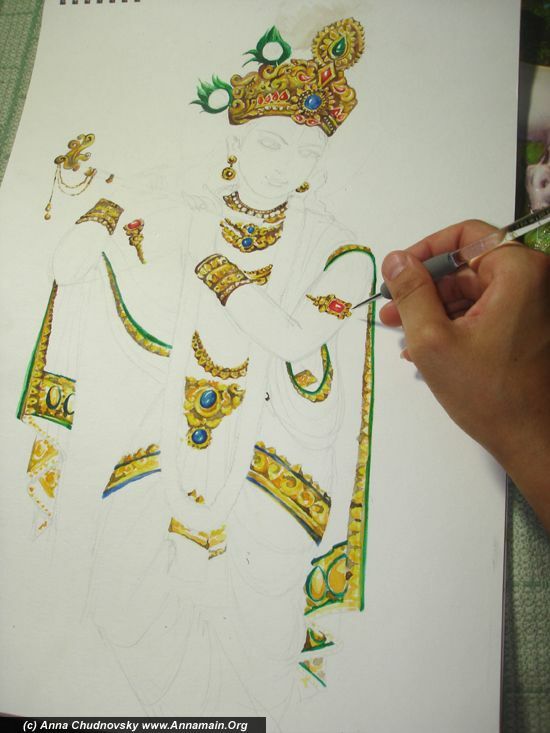 Start to paint gold jewellery of Krishna with light yellow color. Make shadows of gold on jewellery. Finish all shadows of gewellery with brown color. It`s the final view. Start the garland with green leaves separates flowers from each others. Finish the garland of roses with several shadows of rose colors. 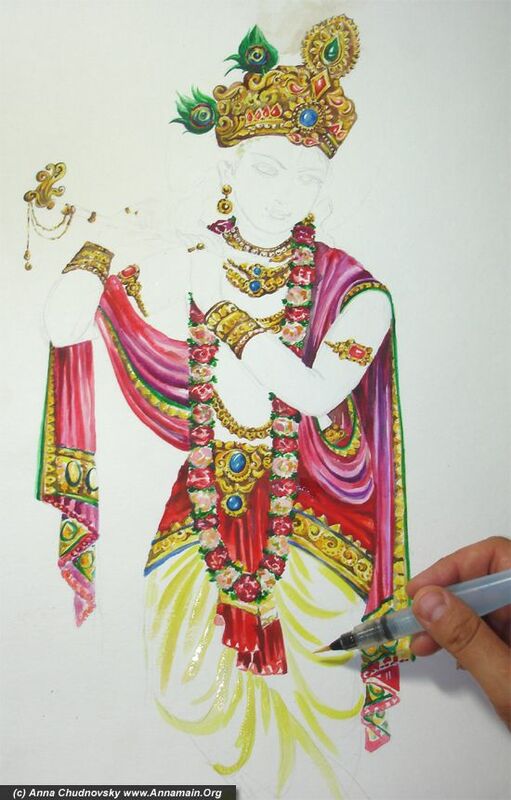 Start to paint Krishna`s zephir with the shadows of red and crimson. Finish with red and crimson clolrs. 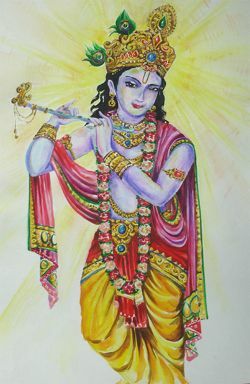 Krishna wears in Indian trouses called "dhoti". This is a rectangular fabric winds to the legs and hips and forms a kind of bloomers. 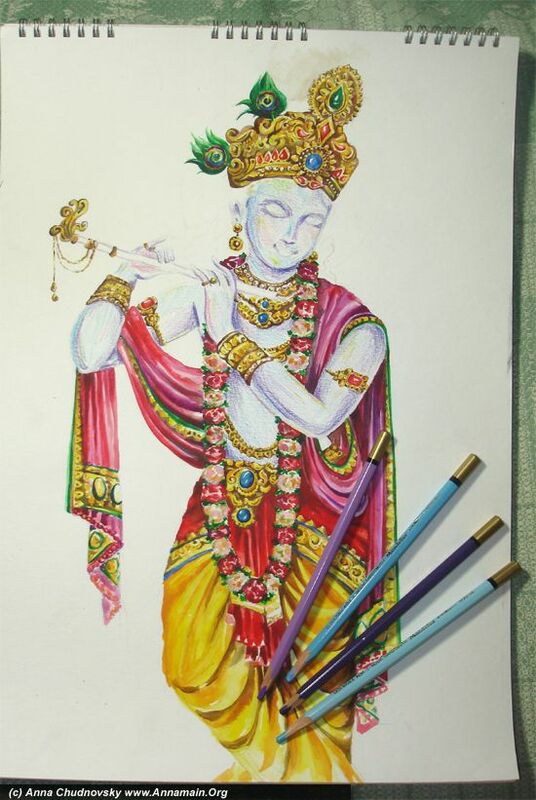 As Krishna is the Avatar of Vishnu, the colors of dhoty is traditionally the same - yellow. I started painting with the light yellow color. 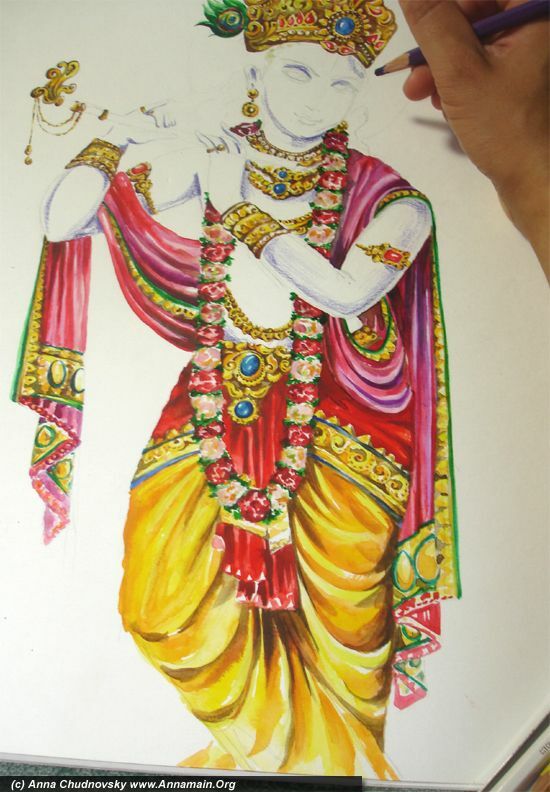 Painting of dhoti is the same as another drapery, with all shadows of gold. First of all this is the more dark violet color to make shadows formed the picture. 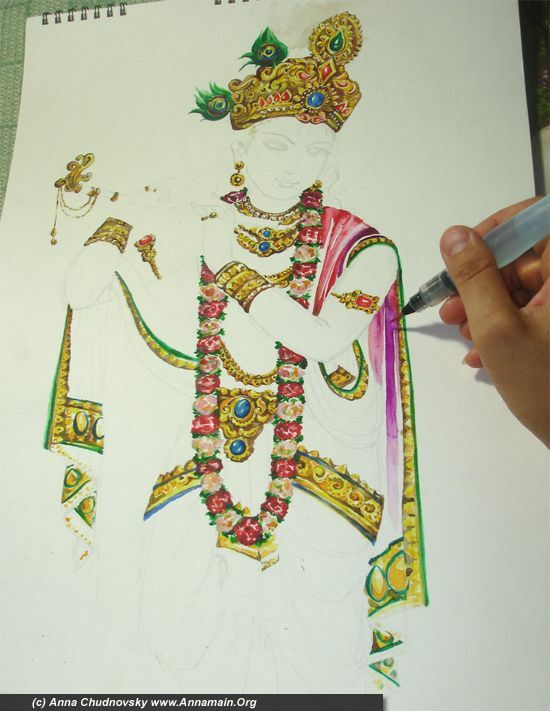 I used 4 colors of blue-violet gamma to draw Krishna`s skin. Before wash out all lines seemed too light, it is normal for aqua pencils. 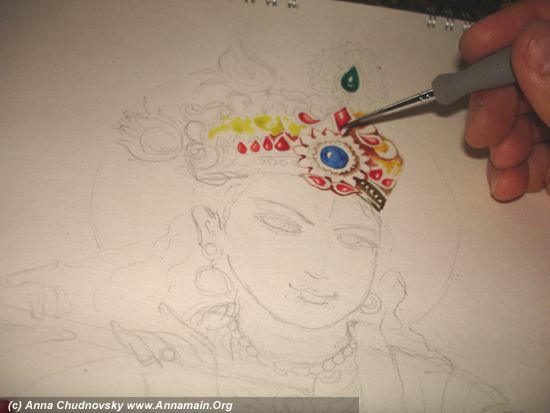 Wash out pencil`s lines with water-brush (or an ordinary brush as well). Important thing is to wash it along line`s direction. 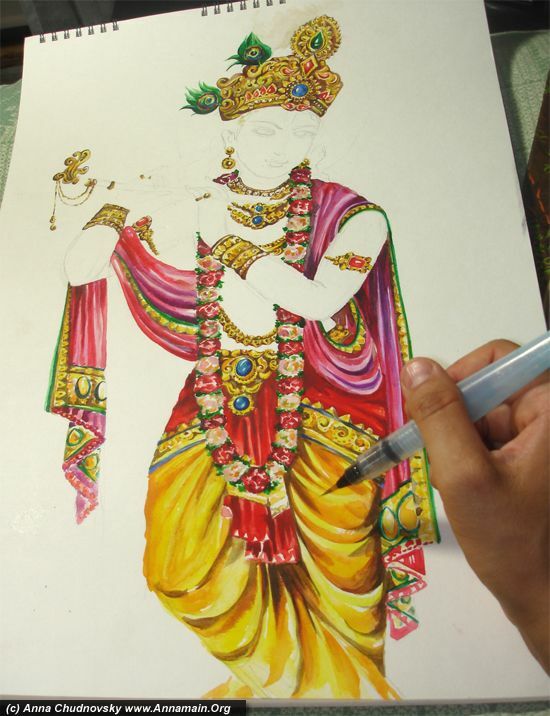 On that step I used black ink to paint Krishna`s hair. The same ink used for eyes and eyebrows. The best way to paint the nimbus is to use aqua pencils. 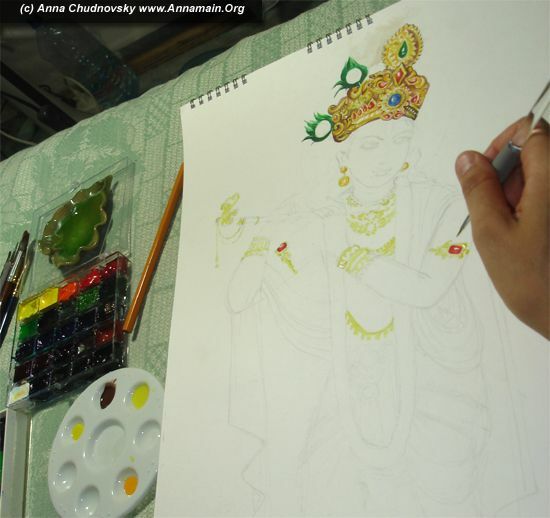 It is important to make lines directly around and radially from Krishna`s head. I used 3 colors of yellow. 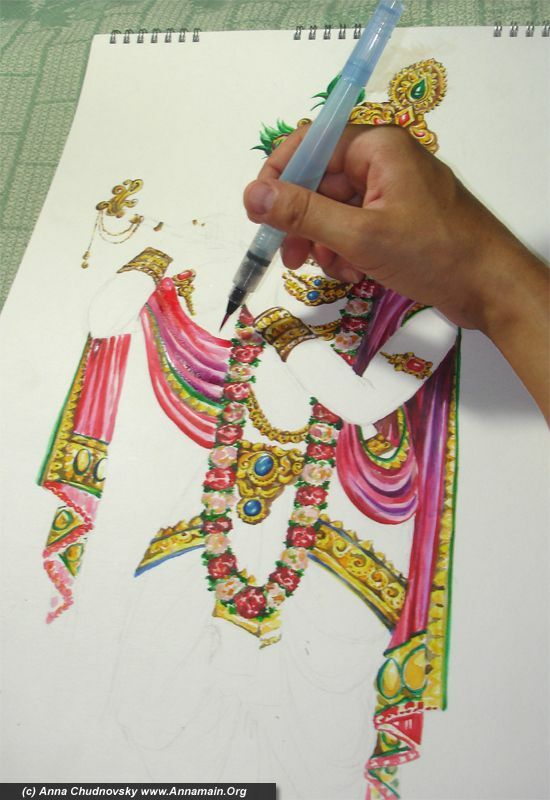 Wash out the pencil`s lines with water-brush carefully with the direction of lines. Now thw work is complete! Well, I have to note such work should be a meditation. 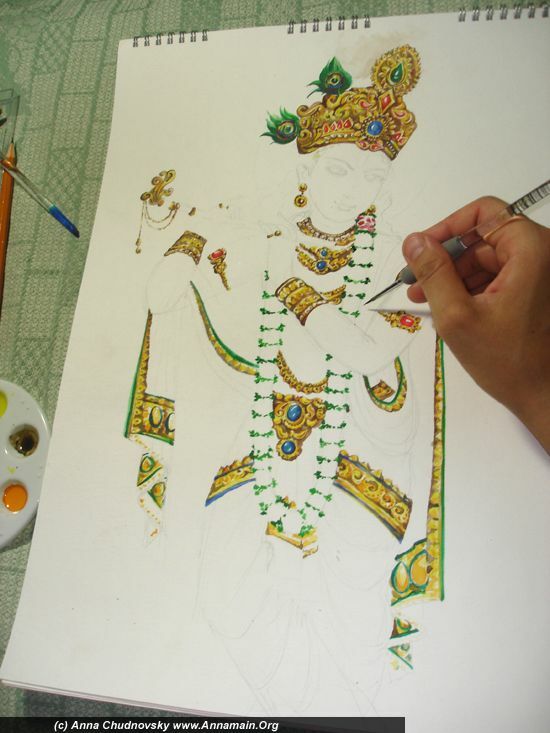 While you paint details you learn more about it, and partly about youself. 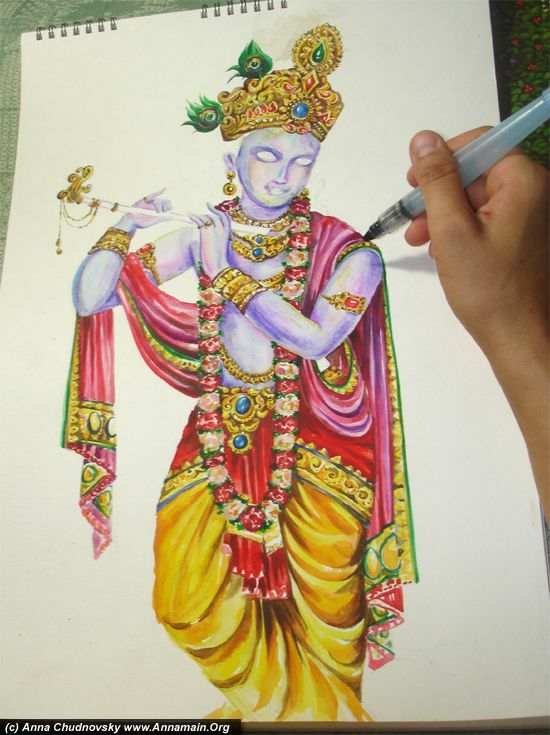 Music in New Agw style, meditative music or mantras is the best company for such work. And at the end you should make a step out of work and drop perfectionism. This is not easy to stop as you think to make something better. But the point is to stop anyway and make a glance to the work and say "I did it as perfect as it could be done". Then it will be a real experience inside. Beautifully written blog post. Delighted I’m able to discover a webpage with some insight plus a very good way of writing. You keep publishing and i’m going to continue to keep reading. Excellent creativity! Awesome print of your picture! Wish you all the best….! Keep it up buddy! I’m okayyy at drawing and painting. Not very good at making it look realistic though. I’m a sophmore in high school. 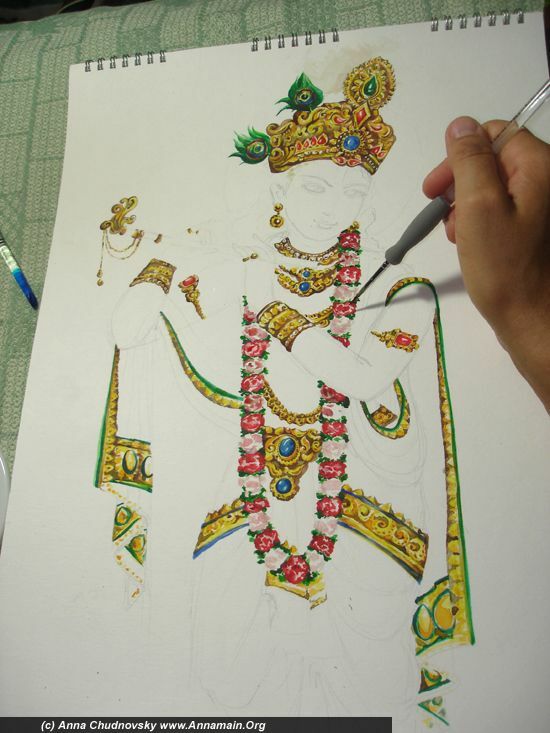 I plan on taking drawing and painting classes at the Maryland Institute College of Art (MICA) this summer. I have a great eye for color and laying things out though! My hobby is also photography. I was just wondering, for my project in math 131 at college, I have 12 pictures of different parametric equations.. Some are so crazy looking, that I have no idea what to do. I’m doing a memory game for psychology class. One of the parts of it is someone gets to look at a complex picture for approx 30 seconds then they have to tell us everything they remember seeing in this picture. I am looking for something to draw in my sketch book. i draw mostly people but i’m trying to expand my mind. I found this picture of a girl’s hair online and I absolutely love it! The size difference is a key factor in comparing iPad and iPhone apps. Practically all iPhone apps (except those for making calls) may be downloaded on the iPad. Only us good metal jewellery (Silver, gold, platinum, titanium, etc) as cartilage is very easily infected. Regarding ends (fastenings) on jewellery, I’d only use metal too, as altough plastic is safe to use, the fastenings can easily snap, and if you lose the earing and dont realise, it might close up and or get infected. This will be extremely attractive! A very nice post it is. I have been seeking this type of knowledge for a long time and by posting this article you have made my work so much easier. I like the way you write the post. So nice picture man really appreciated work. Great job and good to share with us. Best of luck for your next post. Within a short period after the introduction of hcg in the market, it has become so popular. During the initial period, it has to be administered in the form of injections. This was the only problem for people who do not like injections. This problem was also solved by the introduction of hcg drops. 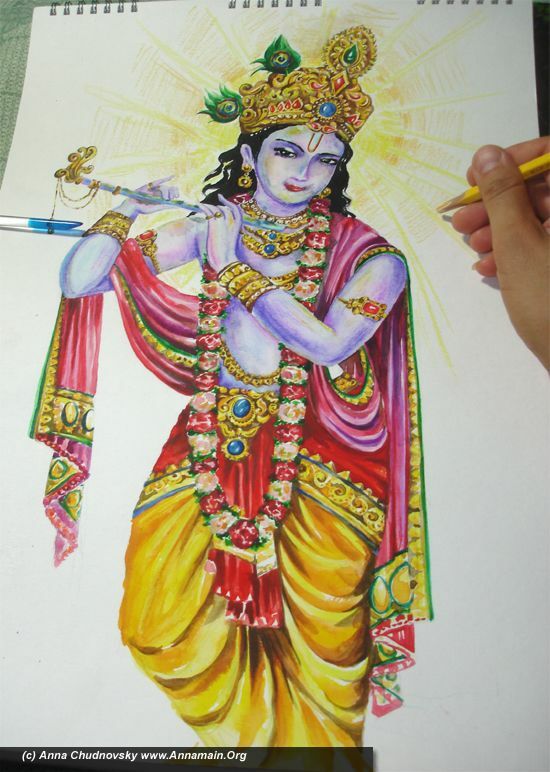 Very nice and so good painting dude. Great job as your painting. I enjoyed your blog. It’s easy to read, the content is good, and you’re an educated writer unlike most of the blogs I come across when searching on this topic. I will check back in the future and see if you have more articles. Thanks for posting this, I appreciate the information and the effort you put into your site. Hi there everybody! Happy New Year and additionally of course Merry Christmas time. I am a little overdue with the actual greetings i am sorry about that. Simply want to commend the writer of the site with regards of the pretty nice work accomplished. I will come to this internet site much more frequently. I’m still in higher education and I ‘m very busy developing term papers. In conclusion, my sincere greetings to you and all the greatest. Thank you for the awesome web-site. I enjoy your style and design. Great site. A lot of useful information here. I’m sending it to several friends ans also sharing in delicious. And of course, thanks for your effort! Hello there! I love the logic and objective viewpoint of the author. Great to see such concepts discussed on the internet. You certainly need to motivate website visitor conversation and talk. Carry on the great work!